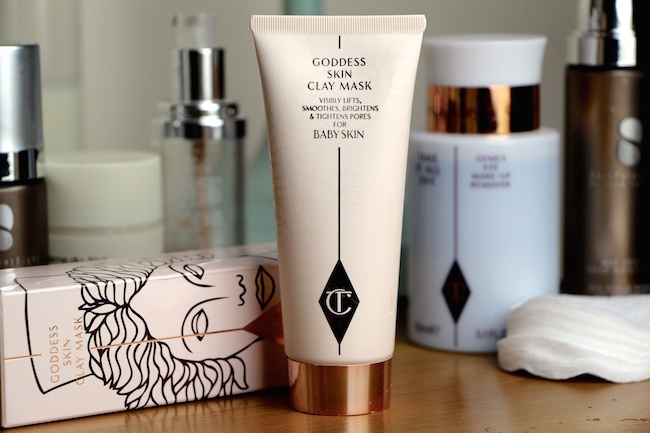 When I first saw the Charlotte Tilbury Goddess Skin Clay Mask I felt a little underwhelmed. I have loads of clay masks. I try loads of clay masks. Some of them are excellent (check out the powerhouse that is Omorovicza’s Deep Cleansing Mask) some of them manage to be deep cleansing and luxurious (see Diptyque and NUXE) but many of them set into a concrete-like layer, leaving the skin a bit dried-out and parched-looking. Some do this as well as leaving the skin smooth, some do this and seem to have no discernible benefits whatsoever. The whole clay thing can be a bit hit and miss. Not so with the Goddess Skin mask: it promises to “visibly lift, smooth, brighten and tighten pores for baby skin” and – unbelievably – it does. I say unbelievably, because it’s quite a lot of claim to make on the front of a tube. Most brands now shy away from making big claims, preferring to hide behind ambiguous phrasing – not Tilbury! She’s the unashamed Queen of Claims and I love her for it. The woman has no fear and enough conviction for a hundred people – she believes in her products and her enthusiasm and belief is highly effective. So, the mask. There’s more claiming on the back of the tube: “for the rebirth of your skin – it’s a miracle! Skin texture appears visibly healed, hydrated and rejuvenated. Skin feels smoother, firmer and plumper.” Just about everything ticked off there, then. But do you know? I rinsed this mask off after ten minutes and my skin was weirdly, weirdly different. It was tightened and lifted but not dried-out, it was smooth but not uncomfortable, it felt incredibly clean but not stripped and the surface felt balanced and somehow primed, if that makes any sense? It was as though I’d had a facial and reached the moisturiser stage, but the moisturiser hadn’t been applied yet. And yet oddly, my skin wasn’t crying out for any moisturiser – I almost wanted to just apply my makeup straight away, because the “canvas” felt so prepped and ready. Pores were less visible, my skin was brighter – it was like the ultimate red carpet fix. No irritation, no “tingling”, just really sorted skin. Another thing to note: to me, this mask smells of tuberose. It could be my sense of smell being slightly skewed, so can anyone who’s tried this please let me know if they think the same? If so, what an utterly beautiful and unusual scent to add to a mask! I really felt as though I was being properly pampered. Additional bonus points for the easy-to-transport tube packaging – no cumbersome pots here – and the fact that you’re directed to only use a thin layer. This mask would last you an absolute age. Top marks to Tilbury on the Goddess Skin Clay Mask, I’m incredibly impressed. You can find it at CharlotteTilbury.com and Selfridges.com. It’s £45 for 75ml, but – as I said – would last an age. Previous Post Things People Say When You’re Pregnant..
Next Post Very Exclusive Discount Code: 30% off Everything!